Psychiatric Disorders is written for researchers in both academia and the pharmaceutical industry who use animal models in research and development of drugs for psychiatric disorders such as anxiety, obsessive-compulsive disorder, depression, schizophrenia, bipolar disorder, ADHD, and autistic spectrum disorder. Psychiatric Disorders has introductory chapters expressing the view of the role and relevance of animal models for drug discovery and development for the treatment of psychiatric disorders from the perspective of (a) academic basic neuroscientific research, (b) applied pharmaceutical drug discovery and development, and (c) issues of clinical trial design and regulatory agencies limitations. Each volume examines the rationale, use, robustness and limitations of animal models in each therapeutic area covered and discuss the use of animal models for target identification and validation. The clinical relevance of animal models is discussed in terms of major limitations in cross-species comparisons, clinical trial design of drug candidates, and how clinical trial endpoints could be improved. 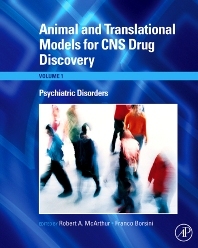 The aim of this series of volumes on Animal and Translational Models for CNS Drug Discovery is to identify and provide common endpoints between species that can serve to inform both the clinic and the bench with the information needed to accelerate clinically-effective CNS drug discovery. This is the first volume in the three volume-set, Animal and Translational Models for CNS Drug Discovery 978-0-12-373861-5, and is also available for purchase individually. Psychiatric Disorders is available for purchase individually.